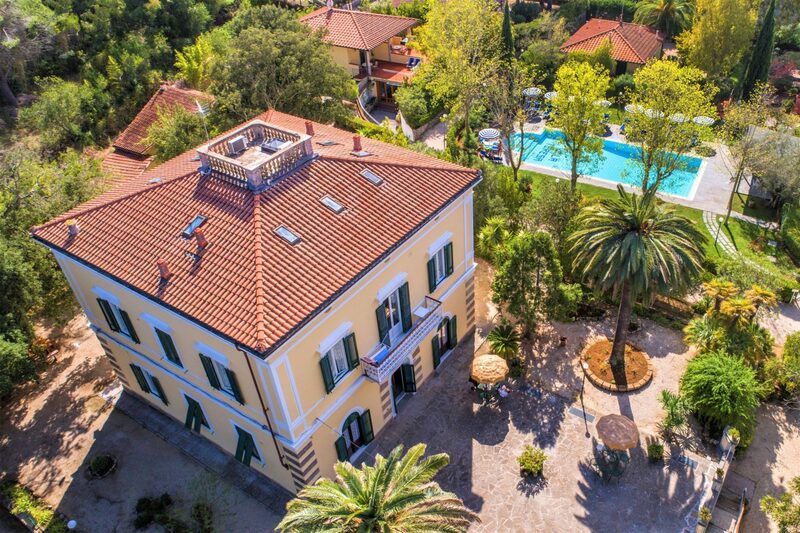 The apartments of Villa Teresa on the island of Elba are only 600m away from the historic center of Porto Azzurro and are a perfect place for a relaxing holiday. The villa is situated in the middle of a green park to ensure complete tranquility and is only a few walking minutes away from the Barbarossa beach and center of the village. Our swimming pool will allow you to better appreciate the quiet of the park and enjoy your holidays with your family on the island of Elba. Villa Teresa is the ideal place for both adults and children, with a field for playing bowls and a small playground for children. You are allowed your small- and medium- sized 4-legged friends in our pet-friendly apartments. The Residence consists of an ancient Villa built at the end of the 19th century and of four bungalows recently built around the pool. 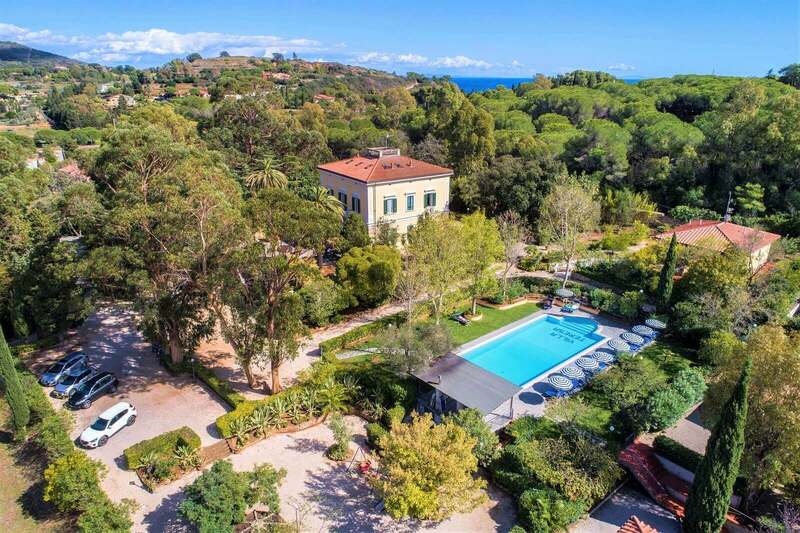 The entire Residence is surrounded by a park and offers plenty of outdoor space for those who wish to spend their holidays on Elba in the atmosphere of a 19th century Villa or for others who prefer the modern decor of the bungalows. The Residence also has private parking with automatic gate, and a barbecue area for guests. 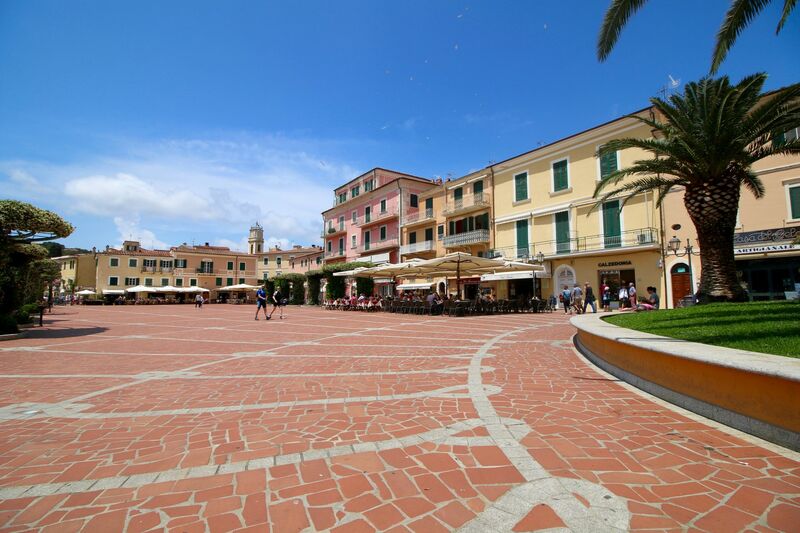 Learn Italian and discover Elba: Holidays & Culture on Elba! The ABC Elba – Centro di Lingua & Cultura Italiana offers Italian language group and individual courses in Villa Teresa. The summer courses were conceived with the idea of connecting a beautiful holiday with a study vacation. The enchanting atmosphere of the island and its relaxing summer weather make study a pleasure. Single-room apartments in 19th century Villa with marble mosaic floors and ceiling decoration. The entire area is covered by Free Wireless Internet access. 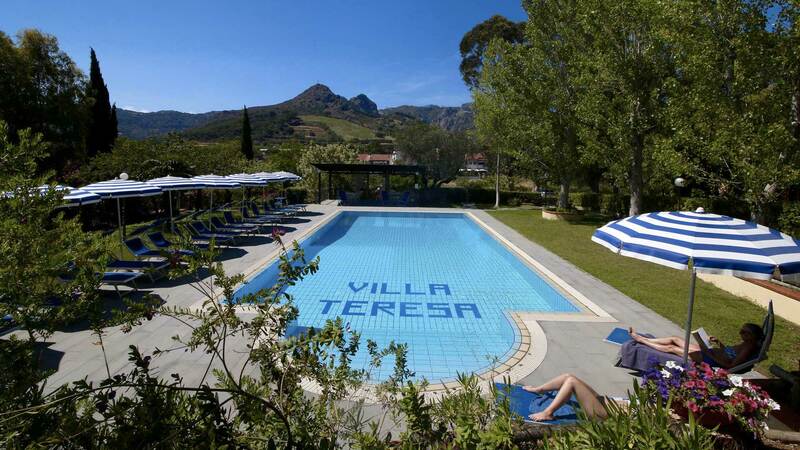 Villa Teresa Card: discounts in shops, restaurants, farms and rentals. In the modern environment of our two-room apartments, you can relax enjoying the private, equipped garden and independent entrance. Lovely site with great access to town and beach. Good pool and charming helpful staff. Very nice and quiet site, the only thing we hear was the singing from the birds. The garden and pool was beautiful. We also likes the nearby center Porto Azzuro 10min walk away. Facilities in the grounds. The quiet villa surroundings, close but on the outskirts of Porto Azzurro, which is a very good destination.